Midwifery assistant training is becoming available in Santa Rosa. Monika Rosicka and Carrie Sparrevohn, local midwives will be leading the course. 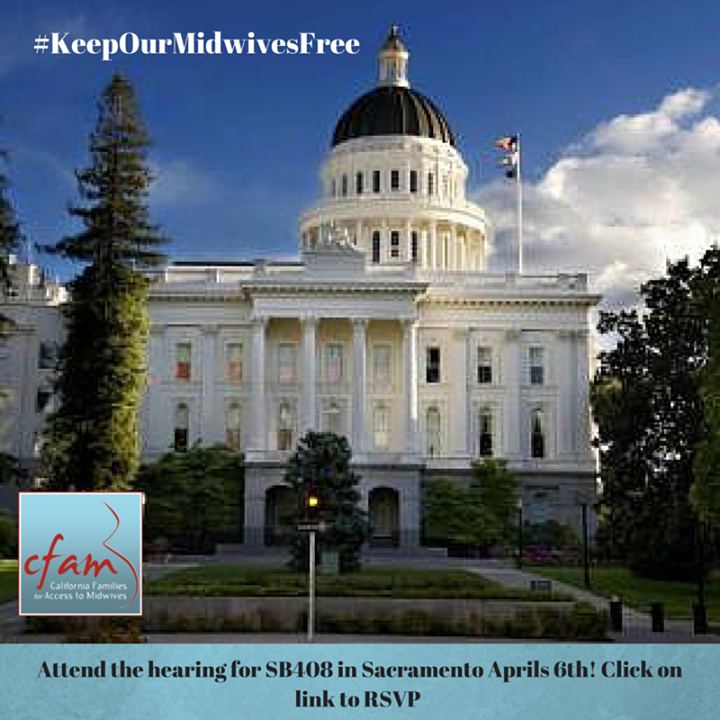 California Access To Midwives- SB408 hearing TODAY! So much is going on in California regarding access to midwives. Today, the hearing for Midwifery Assistant Bill SB 408 is happening. Support for this bill has the possibility of making positive change for the home birth midwifery environment in California. SB 408 would define the role of a "Midwife Assistant." It would allow for the training of individuals for basic care such as, "administration of medicine, the withdrawing of blood, and midwife technical support services under the supervision of a licensed midwife in California. Right now, births are usually attended by two midwives or a licensed midwife and a midwifery student currently enrolled in a midwifery program approved by the state of California. By defining and legalizing the role of a midwife assistant, SB 408 helps standardize care while also allowing more access to midwifery care. Why does this bill matter to you? In rural areas, like northern California, where there are fewer midwives, women can have increased access to midwifery care if the role of a "midwifery assistant" is approved. Midwives can reach more women who wish to safely birth at home, and they can have an attendant who is trained and reliable. Many in California live in areas far from access to hospitals or large midwifery groups. Not only could the passage of SB408 increase access to care, but more midwives means lower health care costs, a universal concern for all Americans. Click on the link below to let them you you are coming! 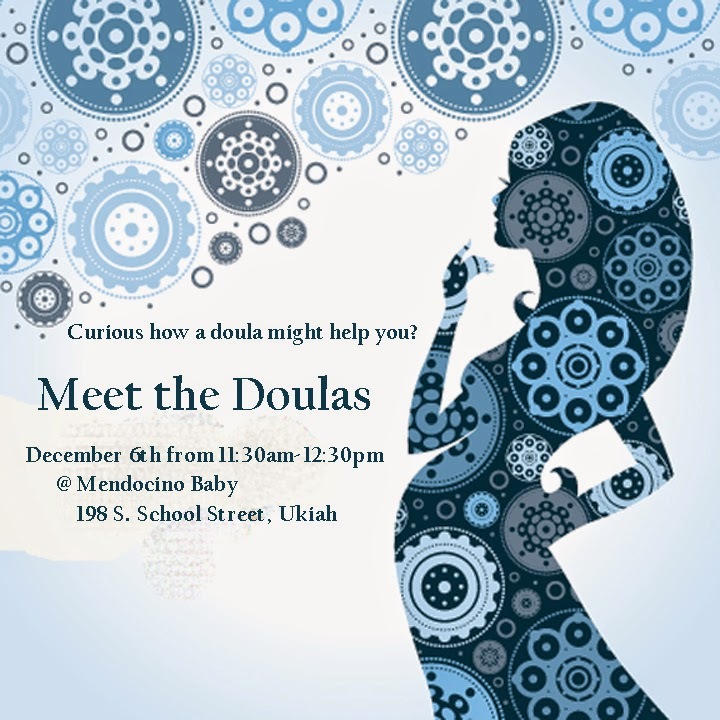 Meet the Doulas DECEMBER meeting in Ukiah. 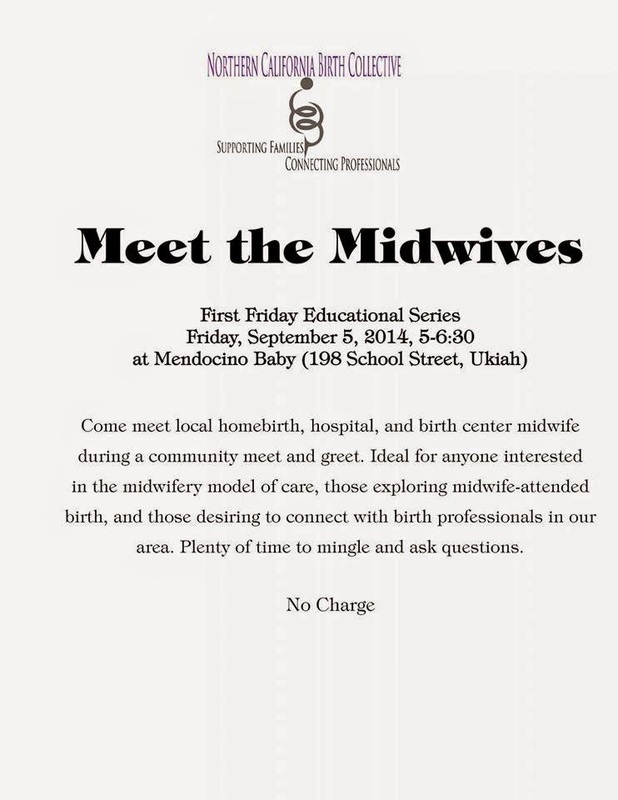 Come meet the local doulas in Mendocino County. Mendocino Baby proudly hosts the Norther California Birth Collective in Ukiah. Come visit. Free, fun, informational. It doesn't get better than this. Meet the Doulas Event in October at Mendocino Baby, Ukiah! Great opportunity to come and meet some of our fabulous local doulas! Make friends, communicate, ask questions, and find out how a doula can improve your birth. NEXT Friday! Come! So much fun and a great opportunity for both birth professionals and local women to meet local midwives! Thanks Monika and Mendocino for hosting! Hello everyone, this is a forward which contains more information on how we can participate alongside CAM's efforts to support availability of midwifery care. Thank you for reading and passing along! -Wendy, Region 1. As we proceed in our legislative efforts this year, we are continuing to focus on the issue of limited access to out-of-hospital birth and licensed midwives. We are seeking testimony from families who desired out of hospital birth but were unable to access it due to the Medi-Cal barrier, as well as testimony from birth workers working with this population. Please forward the form below widely. Were you unable to plan an out-of-hospital birth because licensed midwives are unable to take Medi-Cal? Know someone in this situation? Fill out this form! California Association of Midwives Needs Help!!! If you can help, please contact them! 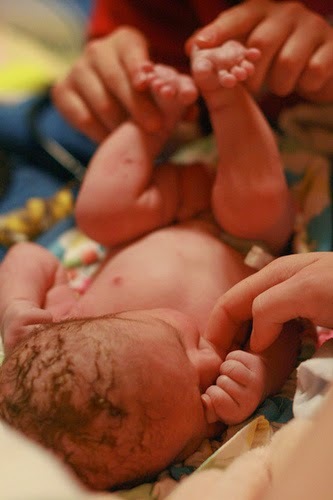 I'm reaching out to you to ask for your help related to California midwifery legislation. Everything is moving very quickly at this point with the upcoming sunset review, our lobbying efforts and introducing our preferred legislation. ACOG has introduced their own bill on midwifery and CAMs efforts to deal with all this effectively is hanging in the balance. Protecting our licenses and our ability to care for families is a urgent matter right now. So here's my request. All of our legislative efforts have caused a massive workload above and beyond our already very busy lives. In order for me to continue at the pace that's needed, I need an administrative assistant to help with communications, scheduling, meetings and whatever else becomes necessary during this legislative process. This could be a student midwife interested in contributing and learning about midwifery politics or a political science student interested in an internship. Someone able and willing to work on our social networking campaign is needed too. This could be the same person or not. I'm not just asking for ideas about where I could look. I'm asking for those of you in CAM region 2 to contribute to our efforts to protect your license by finding someone for me. Ideally someone who lives close enough to come to my home office one or more days a week. A lot can be handled remotely as well. Thank you. I truly appreciate any support you can give with this matter.